I Want to Eat Your Pancreas isn't the first adaptation of author Yoru Sumino's novel Let Me Eat Your Pancreas. A live-action version was released in 2017 in Japan, to rave reviews, but the anime doesn't lose any of the drama or power of the previous work. Instead, it refines them alongside absolutely stellar animation by Studio VOLN. If anything, the animation improves the bittersweet human tragedy of the story, and reinforces the message about the beauty of life despite the reality of death. I Want to Eat Your Pancreas is one of the most heartbreaking anime films you'll ever see, in the best kind of way. The film centers around an unnamed protagonist, played in the English dub by Robbie Daymond. A quiet and solitary young man, he works in the library and seems completely unperturbed by his standing as a loner. But a chance encounter with the most popular girl in his class changes things. He discovers that the girl, Sakura (a very impressive Erika Harlacher), is dying of a pancreatic disease and only has a few years left, at most. She's kept it a secret from her friends so she can still enjoy a normal teenage life before she dies, but the young man proves to be the perfect outlet for her fears about the illness. He becomes her secret keeper and reluctant companion as she tries to finish everything on her bucket list before her time runs out. Right from the beginning, the film explores her mortality with a bubbly edge. Sakura herself is instantly likable; she's peppy, strong-willed and kind. But she's not treated as a complete paragon, just as a nice girl who can get frustrated and angry, and probably enjoys playing pranks just a little bit too much. While the film flirts with more obvious arcs, it subverts them in interesting ways. Sakura and the boy don't necessarily fall in love, but that potential (and the fact that everyone at school assumes they're dating) is definitely played with in interesting ways. The voice acting throughout is genuine and tender, and helps the film remain enjoyable while never become schmaltzy. 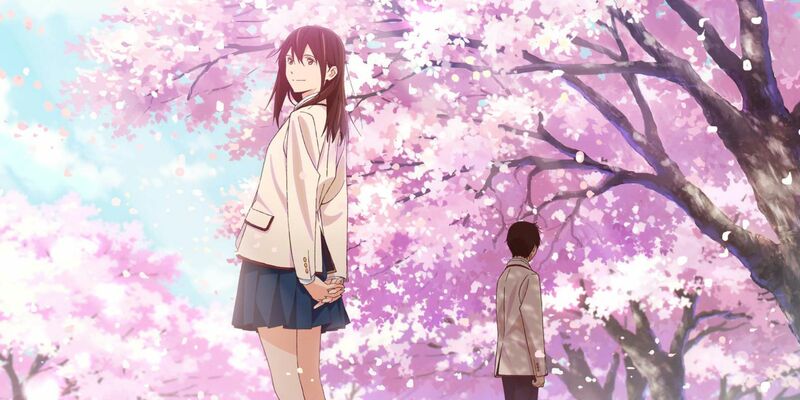 I Want to Eat Your Pancreas works incredibly well for the genre it inhabits, an animated version of something like The Fault in Our Stars, but with a better handle on teenagers and their emotions. The unnamed boy's personal arc explores his chosen isolation and even hints at his crippling depression, making his growth through his experiences with Sakura about more than just friendship. The film is heady and willing to explore the complicated feelings of being a teenager, even without the lingering expectation of death hanging overhead. As a bittersweet and meaningful story, the film succeeds with gusto. But it's the animation that elevates it to something else. The character work is detailed and specific enough to succeed in the smaller moments, with the occasional flashes of action. The film is able to shift tones with ease, in part due to the evocative imagery created by Studio VLON. There are two sequences in particular, one during a fireworks display and the other at the end of the film, that use their inherently visual deviations from the bittersweet reality of the rest of the world to truly stand out. Seriously, it's one of the strangest and most memorable moments seen in an animated film in years. At the screening for the film, representatives from Aniplex made sure to hand all members of the audience a box of tissues. It just goes to show how much confidence the studio had in the film being able to evoke the appropriate emotions, and it proved to be a good call. There wasn't a dry eye in the theater after the movie concluded. The film is being released in theaters across the United States in conjunction with Fathom Events and the National Pancreas Foundation. The film does an amazing job of humanizing a deliberating illness in the most painful way, and is an honest tearjerker. Even if you end up missing the screenings of the film through Fathom, make sure you give this film a chance when you get the opportunity. The story and characters are all incredibly well done throughout. It's one of the best tearjerkers in years, and the animation especially makes it stand out in a field of other, lesser versions of similar stories. I Want to Eat Your Pancreas is one of the best new anime films to be released and is worth checking out.